Thomas Keating started - so we believe - in the 1780's off St Paul's Churchyard in the City of London. It was a chemists shop and through the 19 Century developed two products: A cough lozenge sold during the winter and an Insecticide sold during the summer. The latter, which became a household name, was based upon pyrethrum, although there as a rumour that the same ingredients were used in both. 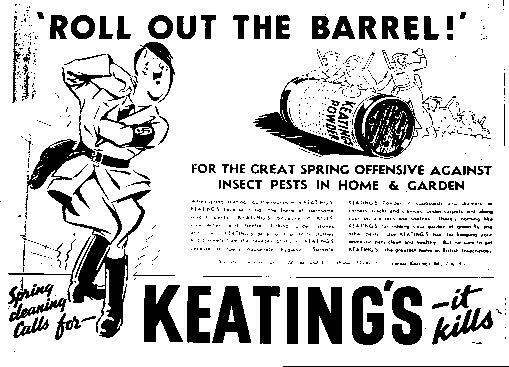 My family became involved in the business when my great grandfather became the general manager of the business at the turn of the century and had two instructions from the last remaining spinster Keatings - Firstly to make as much money as possible, and secondly not to advertise the product within 10 miles of where they lived as they did not want to be associated with it. Being in Trade now is bad enough, but is was worse then. When the spinsters died, he bought the business off their executors. Sales boomed during the First world war as troops returning to the front would carry a picture of their loved ones plus a couple of packets of Keating's Powder. During the twenties and thirties, with improving public health, sales slowly but inexorably declined and my parents generation had to find something else to do. It has been said that the half-life of a business may be forty years or so. They may last a generation doing one thing, but are unlikely to last two. A whole range of projects were tried and at the beginning of the last war they stumbled into precision toolmaking. They decided to build a toolroom and to concentrate on doing the very most demanding work. There was sense in this - during war time there was no shortage of all types of government work and given the very high rate of corporation tax, it did not really matter what one charged as all ones profits, quite rightly, when back to the Treasury. But after the war was over they knew that businesses doing run-of-the-mill work would not survive the inevitable downturn. During the next thirty years a high precision toolroom making presstools and injection moulds for the watch, telephone and aerosol industries, was built up - all requiring very high precision machining. Starting in the 1980's these toolmaking skills and technologies have been applied to servicing the scientific community, in particular to the design and manufacture of THz instruments for cosmology, astronomy, atmospheric remote sensing, plasma fusion diagnostics and material measurements.